This plant belonging to family Euphorbiaceae grows well in Assam, Bengal, and the Western Ghats. ■■ This plant belonging to family Euphorbiaceae grows well in Assam, Bengal, and the Western Ghats. ■■ It is a small evergreen tree with ovate or elliptical leaves which are narrow-pointed, toothed, and 2 to 4 inches long, varying in colour from metallic green to bronze, orange, or yellowish (Fig 10.10). 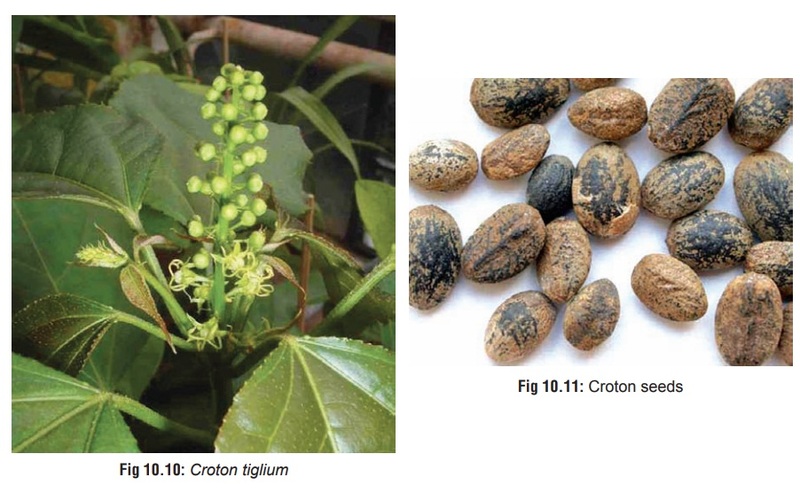 ■■ Seeds are oval, smooth, 1 to 2 cm long, and brownish in colour (Fig 10.11). The seeds, oil, and root extract are used as a drastic purgative in folk medicine. · Plants in this family contain irritant diterpene esters that are strongly irritating. Rubbing the latex of these plants to the face, or chewing on the stem may result in erythema, swelling, and blistering. Initial symptoms of reddening and swelling occur in 2 to 8 hours, with vesicle and blister formation peaking in 4 to 12 hours. Severity depends on the amount of plant latex and the duration of contact. · Ingestion results in burning pain in the upper GI tract, vomiting, tenesmus, watery or blood-stained diarrhoea, hypotension, collapse, coma, and death. 2. Treatment of shock with IV fluids and dopamine. 3. Administration of cold milk may alleviate the GI irritation.